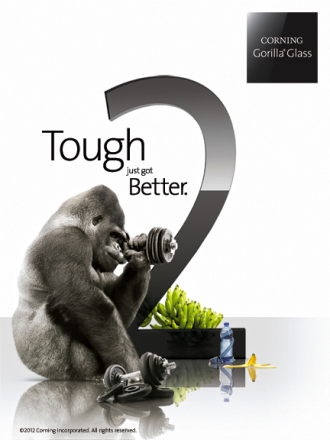 Corning is shipping samples of an updated version of its popular Gorilla Glass product that will allow screens to be 20 percent thinner at the same strength. While the space saved will work out to only about 0.1 mm in most smartphones, for example, it will provide additional benefits such as greater visibility and less resistance for touch-sensing components, said David Velasquez, head of marketing for the glass. The company is putting on demonstrations this week at the Consumer Electronics Show in Las Vegas showing that a thinner slice of the new product is as strong as the existing version. Mass production is to begin in the first half of this year. The company does not disclose price information, but Velasquez said "there is no planned price premium for the new product." Corning has achieved the stronger material by tweaking its composition. Like similar products, Gorilla Glass is tempered through immersion in a salt bath to toughen its composition. The company is currently ramping up production and will produce the new version nearly exclusively by 2013, though it will still make some of the original glass for legacy customers. Introduced in 2007, Gorilla Glass is far more resistant to scratches and cracks than ordinary glass or plastic, and is now one of the U.S. glass maker's profit mainstays, though the company does not break out specific sales. Teardowns have shown it is widely used in phones, tablets, and other handheld devices.